سلطانی مقدم, سعید, سپانلو, کامران, خیری ملومه, میثم. (1397). تعیین ساختار سرعتی و مطالعه لرزه‌خیزی تهران و ارتفاعات البرز در دهه اخیر. مجله ژئوفیزیک ایران, 12(2), 78-95. سعید سلطانی مقدم; کامران سپانلو; میثم خیری ملومه. "تعیین ساختار سرعتی و مطالعه لرزه‌خیزی تهران و ارتفاعات البرز در دهه اخیر". 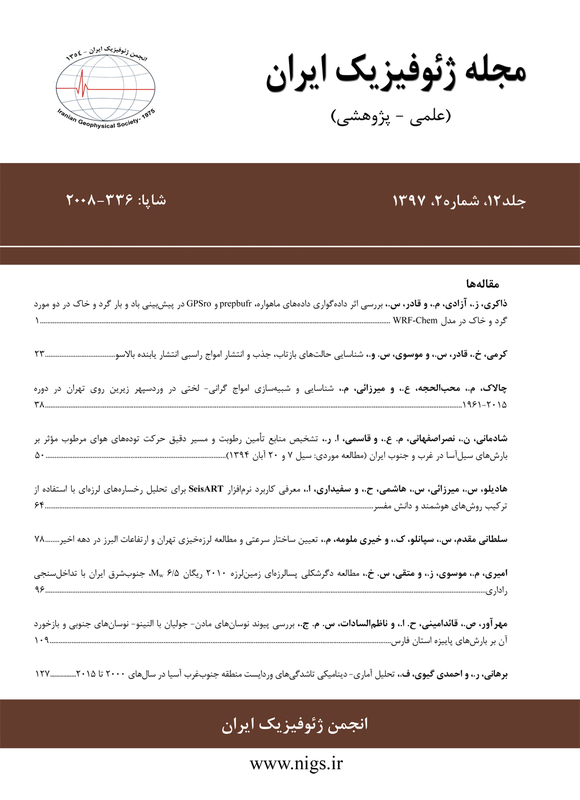 مجله ژئوفیزیک ایران, 12, 2, 1397, 78-95. سلطانی مقدم, سعید, سپانلو, کامران, خیری ملومه, میثم. (1397). 'تعیین ساختار سرعتی و مطالعه لرزه‌خیزی تهران و ارتفاعات البرز در دهه اخیر', مجله ژئوفیزیک ایران, 12(2), pp. 78-95. سلطانی مقدم, سعید, سپانلو, کامران, خیری ملومه, میثم. تعیین ساختار سرعتی و مطالعه لرزه‌خیزی تهران و ارتفاعات البرز در دهه اخیر. مجله ژئوفیزیک ایران, 1397; 12(2): 78-95. زمین‌لرزه اخیر ملارد تهران و وقوع چهار زمین‌لرزه با بزرگای بیش از چهار طی یک دهه اخیر، به‌خوبی اهمیت مطالعه لرزه­خیزی کلان‌شهر تهران را مشخص می­کند. در این مطالعه، سعی شده با نگاهی جامع به اطلاعات لرزه­ای موجود در یک دهه گذشته، لرزه­خیزی شهر تهران و مناطق اطراف بررسی شود. به‌این‌منظور، از اطلاعات سه شبکه لرزه­نگاری دائمی فعال در منطقه استفاده شد. با ادغام اطلاعات این سه شبکه، حذف انفجارات و داده­های پرت، تعداد 2000 زمین­لرزه در بانک داده اصلی قرار‌گرفت. با انتخاب همگن 310 رویداد به شیوه تفکیک سلولی در سه بعد، ساختار سرعتی منطقه با استفاده از الگوریتم بهینه­سازی ازدحام ذرات محاسبه شد. سپس بانک داده با استفاده از برنامه غیرخطی احتمالاتی، مجدداً مکان­یابی شد. نتایج مکان­یابی نشان می­دهد 40 درصد از رویدادهای مکان­یابی شده، خطای رومرکزی کمتر از 5/2 کیلومتر، خطای عمق کمتر از 5 کیلومتر و میانگین باقی‌مانده زمانی 24/0 ثانیه دارند. در ادامه، زمین‌لرزه­ها براساس عدم قطعیت­های محاسبه شده در سه کلاس مختلف دسته­بندی شدند. برای بررسی دقیق­تر هندسه گسل­های فعال منطقه، چندین مقطع عمقی رسم شد. در‌انتها، سازوکار کانونی 38 زمین‌لرزه به‌وقوع‌پیوسته در تهران و محدوده اطراف آن، با روش قطبش اولین موج تراکمی، محاسبه شد. نتایج این بررسی نشان می­دهد طی یک دهه گذشته، بخش­های شرقی فعالیت بیشتری از خود نشان داده­اند و زمین‌لرزه ملارد تهران در غرب، در منطقه­ای با لرزه­خیزی نسبتاً کم، به‌‌وقوع‌پیوسته­است. با بررسی میدان تنش، جهت تنش بیشینه، N36E، نسبت تنش برابر 12/0 و رژیم زمینساختی راستالغز فشاری به‌دست‌آمد. بر‌‌اساس زاویه لغزش در دایره مور، اکثر صفحات گسلی اصلی با روند شرقی- غربی، سازوکار چپ‌گرد را تأیید می­کنند. این نتایج، همخوانی بسیار خوبی با روندهای موجود در ناحیه شمال تهران نشان می­دهند. An earthquake of local magnitude 5.2 which occurred in Malard recently, was accompanied by four earthquakes with local magnitudes largerthan 4.0 These events can be considered as a manifestation of the state of Tehran, a mega-city with more than 13 million inhabitants, in last decade. For this reason, we tried to do a comprehensive seismic study on Tehran and surrounded area using all available data. In order to do this, we used three independent datasets belonged to Iranian Seismological Center (IRSC), International Institute of Earthquake Engineering and Seismology (IIEES) and Tehran Disaster and Mitigation Organization (TDMMO). We merged these three datasets to get a uniform one, using 3D cells gridding technique and then explosions or outliers were removed. The final dataset included 2000 events. Using 310 selected events based on horizontal and depth errors, azimuthal gap, RMS and minimum number of recording stations, we calculated 1D velocity model by utilizing Particle Swarm Optimization (PSO) method. The calculated model consists of three layers. The thickness and P velocity of layers are 4.0 km and 5.4 km/s, 6.0 km and 5.8 km/s and 5.0 km and 6.05 km/s for the first, second and third layer, respectively. The final layer is a half-space with a P velocity of 6.5 km/s. The computed Vp/Vs is 1.71. Then all events were relocated using our new velocity model utilizing fully non-linear probabilistic method to get as much as possible accurate locations. The results show that 40% of all relocated events have uncertainties less than 2.5 km and 5.0 km in horizontal and vertical direction, respectively. The final calculated mean RMS is ~ 0.24 s. In order to define the geometry of the active faults, three different subsets of events were selected based on their location uncertainties, azimuthal gap, RMS and minimum number of recording stations. This helped us to use well-located events for better defining of the fault traces on map view and in depth cross-sections. We plotted four cross-sections perpendicular to the strike of the main faults in the region. The focal mechanism solutions for 38 selected events were also computed based on P-wave first polarity method. The final results show that the eastern part of the study region is more active than the western part, at least in the last decade, and surprisingly, the Malard earthquake occurred in a region without any major activity from three months before the main shock. Stress field study also reveals that the maximum stress axis is N36E and the main seismotectonic regime is left lateral structures. These results are very consistent with the main trends of the North Tehran fault. سلطانی مقدم، س.، شمالی، ظ.ح.، حاتمی، م.، 1394، تعیین مکان مجدد زمین‌لرزه‌های ورزَقان- اَهر 5/6 Mw و 3/6 Mw و پس‌لرزه­های آن با استفاده از الگوریتم غیرخطی احتمالاتی: مجله ژئوفیزیک ایران، 9(3)، 143-159. یمینی فرد، ف.، مرادی، ع.، 1390،.بررسی ساختار سرعتی پوسته تهران با استفاده از داده­های دور و انفجار معدن ثبت شده در شبکه لرزه­نگاری شهر تهران: مجله فیزیک زمین و فضا، 37(3)، 59-69. یمینی فرد، ف.، مرادی، ع.، و نقوی، م.، 1391، پارامترهای چشمه زمین‌لرزه 25 مهرماه 1388 ری‌- تهران، با بزرگای گشتاوری 3/4: مجله ژئوفیزیک ایران، 6(3)، 46-58. Abbassi, M. R., and Farbod, Y., 2009, Faulting and folding in quaternary deposits of Tehran’s piedmont (Iran): Journal of Asian Earth Sciences, 34(4), 522-531. Abbassi, A., Nasrabadi, A., Tatar, M., Yaminifard, F., Abbassi, M. R., Hatzfeld, D., and Priestley, K., 2010, Crustal velocity structure in the southern edge of the Central Alborz (Iran): Journal of Geodynamics, 49(2), 68-78. Alizadeh, A., and Hoseynalizadeh, Z., 2017, Analysis of the stress regime and tectonic evolution of the Azerbaijan Plateau, Northwestern Iran: Geotectonics, 51(3), 308-318. Ambraseys, N. N., and Melville, C. P., 2005,.A history of Persian earthquakes: Cambridge University Press. Ashtari, M., Hatzfeld, D., and Kamalian, N., 2005, Microseismicity in the region of Tehran: Tectonophysics, 395(3-4), 193-208. Delvaux, D., and Sperner, B., 2003a, Stress tensor inversion from fault kinematic indicators and focal mechanism data: the TENSOR program: Nieuwland (Doctoral dissertation, D.(ed. ), New Insights into Structural Interpretation and Modelling, Geological Society, London, Special Publications, 212, 75-100. Delvaux, D., and Sperner, B., 2003b, New aspects of tectonic stress inversion with reference to the TENSOR program: Geological Society, London, Special Publications, 212(1), 75-100. Eberhart, R., and Kennedy, J., 1995, A new optimizer using particle swarm theory: Micro Machine and Human Science, MHS'95., Proceedings of the Sixth International Symposium, 39-43, IEEE. Fischler, M. A., and Bolles, R. C, 1981, Random sample consensus: a paradigm for model fitting with applications to image analysis and automated cartography: Communications of the ACM, 24(6), 381-395. Guest, B., Axen, G. J., Lam, P. S., and Hassanzadeh, J., 2006, Late Cenozoic shortening in the west-central Alborz Mountains, northern Iran, by combined conjugate strike-slip and thin-skinned deformation: Geosphere, 2(1), 35-52. Hessami, K., Jamali, F., and Tabassi, H., 2003, Active Fault Map of Iran: Proof print, International Institute of Earthquake Engineering and Seismology, Tehran, Iran. Kissling, E., Ellsworth, W. L., and Cockerham, R. S., 1984, Three-dimensional structure of the Long Valley Caldera, California, region by geotomography: U.S. Geological Survey, Open File Rep, 84(939), 188-220. Lomax, A., Virieux, J., Volant, P., and Berge-Thierry, C., 2000, Probabilistic earthquake location in 3D and layered models: Advances in seismic event location, Springer, Dordrecht, 101-134. Moradi, A. S., Hatzfeld, D., and Tatar, M., 2011, Microseismicity and seismotectonics of the North Tabriz fault (Iran): Tectonophysics, 506(1-4), 22-30. Mottaghi, A. A., Rezapour, M., and Yaminifard, F., 2010, Double-difference relocation of earthquake hypocenters along the southern flank of the Central Alborz, Iran: Bulletin of the seismological society of America, 100(5A), 2014-2023. Nazari, H., Ritz, J. F., Salamati, R., Shahidi, A., Habibi, H., Ghorashi, M., & Bavandpur, A. K., 2010, Distinguishing between fault scarps and shorelines: the question of the nature of the Kahrizak, North Rey and South Rey features in the Tehran plain (Iran). Terra Nova, 22(3), 227-237. Nemati, M., Hatzfeld, D., Gheitanchi, M.R., Sadidkhouy, A., Mirzaei, N., 2011, Microseismicity of the Firuzkuh and Astaneh faults East Alborz, Iran: Tectonophysics, 506, 11-21. Ritz, J. F., Balescu, S., Soleymani, S., Abbassi, M., Nazari, H., Feghhi, K., and Michelot, J. L., 2003, Determining the long-term slip rate along the Mosha Fault, Central Alborz, Iran. Implications in terms of seismic activity: Proceeding of the 4th International Conference on Seismology and Earthquake Engeneering, Tehran, Iran, 1214. Talebian, M., Copley, A. C., Fattahi, M., Ghorashi, M., Jackson, J. A., Nazari, H.,and Walker, R. T., 2016, Active faulting within a megacity: the geometry and slip rate of the Pardisan thrust in central Tehran, Iran:.Geophysical supplements to the monthly notices of the Royal Astronomical Society, 207(3), 1688-1699. Tarantola, A., and Valette, B., 1982, Inverse problems = Quest for information: Journal of Geophysics, 50(3), 150-170. Tatar, M., Hatzfeld, D., Abbassi, A., and Yamini Fard, F., 2012, Microseismicity and seismotectonics around the Mosha fault (Central Alborz, Iran): Tectonophysics, 544, 50-59. Wiemer, S., 2001, A software package to analyze seismicity: ZMAP: Seismological Research Letters, 72(3), 373-382.